theMALC: Dubliner Liam Brady Is Guest Examiner For Black Belt Testing In Bethany Beach, Delaware U. S. A. During the annual Bethany Beach Residential The Martial Arts Learning Community (TheMALC) board of examiners evaluated three candidates for promotion. Heading the evaluation team was Senior Instructor Liam Brady of Brady Kenpo Schools Dublin, Ireland. Other examiners included Professor Dennis Lawson of www.yourkenpo.com, Melvin and Diane Ruth of M & D’s Modern Martial Arts Bishopville, MD, and Ms Lena Varuolo of www.defenseawareness.org (not shown in photo). Ms Varuolo is the current president of TheMALC. Being evaluated for promotion were John Davis of Salisbury, MD and JJ Simon of Delmar, DE for Associate Instructor and Mark Brosten of Missoula, Montana for Senior Instructor. Evaluations started at 9 AM on Sunday, October 3rd with the physical test being completed by Tuesday, October 5th. Candidates’ thesis projects were reviewed and sessions for feedback from the examiners included a Skype call with Professor Richard Matthews of Kenpoworks Jersey, Channel Islands. Mr. Matthews was unable to attend this year’s Residential but sent along a video with training suggestions. He had coached all three candidates during their progression to this 4th Bethany Beach evaluation. Each black belt, whether examiner or candidate, presented at least one class during the Bethany experience. Mr. Lawson started things off with a class on moving and tonal meditation on the beach. Mr. Brady taught a lively class on refereeing and judging tournament competitions. Mark Brosten presented lessons on improving attention and long term memory retention along with his latest video project. Lela Simon, the only non-black belt instructor and Director of Fitness(es) for TheMALC “crushed” everyone with her class on cardiovascular fitness and strength training for large muscle groups. Mr. Melvin Ruth presented his Groundwork for Self-Defense project and his lovely wife, Diane kept us moving and laughing with her unique method for teaching martial arts principles and life skills to children. Lena Varuolo taught a class on intuitive awareness. Partners trained various ideas using blindfolds, with minimal body contact, of course. JJ Simon brought us back to “looking at our minds” as he guided us in his seated meditation class. 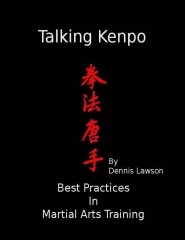 John Davis led a class on what Short Form 2 (Ed Parker’s Kenpo) teaches. When John wasn’t teaching, testing, or training he was busy cooking stuffed pork loin (or tofu for our vegetarians) or preparing homemade waffles and buckwheat pancakes for breakfast. By Thursday the evaluations were complete. Certificates were signed and champagne corks were popped. John whipped up a beranise sauce to go with the grilled filet mignon and garlic mashed potatoes. Mr. Brady topped off the evening’s presentations with a surprise gift. Liam presented Mr. Lawson a beautiful bronze statue (The Children of Lir) to celebrate Dennis’ 40th year of studying Mr. Parker’s Kenpo. The Martial Arts Learning Community (TheMALC) is a Non-Profit Agency chartered in the state of Delaware. The MALC supports various studies of the history and development of the Martial Arts, studies using a scientific approach to identify Best Practices in the Martial Arts, and the publishing of these research works. The MALC supports the study of the Martial Arts as physical education. Our community produces educational seminars, workshops and consults with various Martial Arts clubs and studios regarding training methods and business practices. Contact www.themalc.org for more information.